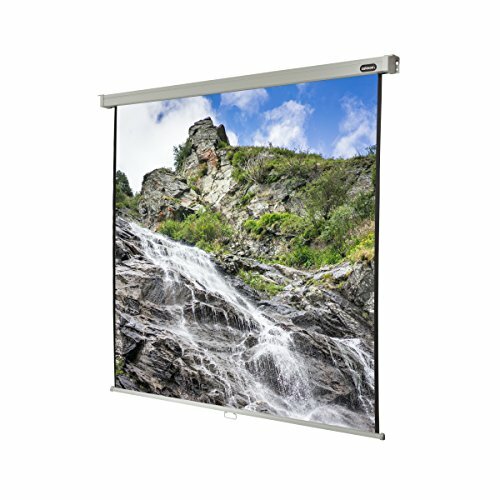 The celexon 122“ manual pull down projector screen is part of the celexon Manual Professional series. This high quality and robust manual screen can be used with any projector system. This high quality pull down screen is suitable for conference rooms, home cinema or other purposes. The thick and heavy fabric is perfectly flat and ensures excellent projection results. The high-quality adjustment mechanism enables settings at different formats and makes the screen suitable for different aspect ratios: from 1:1, 4:3, 16:9 to 21:9. The projector screen has a gain factor of 1.2 and is suitable for LCD and DLP projectors. The black back is impervious to light and ensures a clear projection. The viewing area is surrounded by a black border that ensures a better conrast an improves the flatness of the fabric. Fixings for wall or ceiling mounting are included.